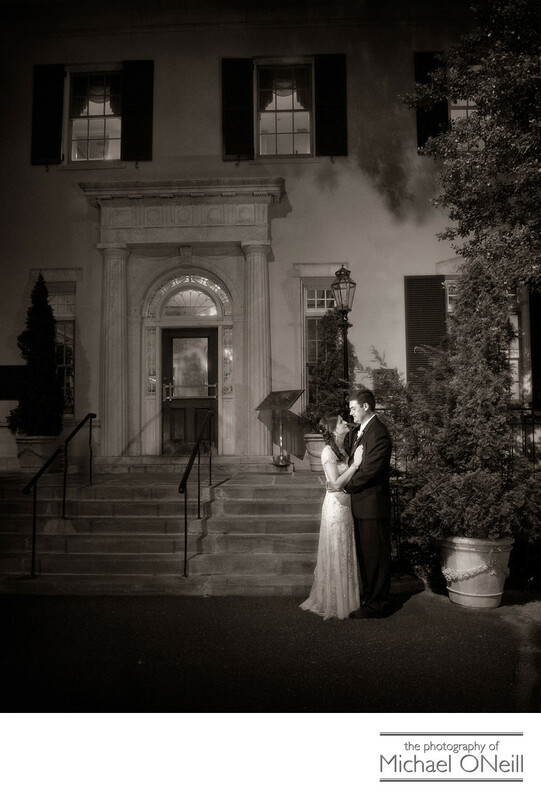 This wedding photograph was captured outside the mansion at The Woodlands in Woodbury, NY. This is another of the spectacular mansions on Long Island that are perfect for wedding photography as well as for catering your elegant wedding reception. Some of the others include The Glen Cove Mansion, Oheka Castle in Huntington, New York; The deSeversky Mansion at NYIT; The Royalton at Roslyn Country Club; The Bourne Mansion in Sayville, NY; Coe Hall at Planting Fields Arboretum in Oyster Bay; Mill Neck Manor; The Mansion at Old Westbury Gardens and Fortunoff Hall at Dowling College in Oakdale. In my years as a Long Island wedding photographer I have had the privilege of working at all of these wonderful venues, creating beautiful wedding photographs for amazing couples. As you peruse this web site you will see many examples of my award-winning wedding photographs...many of which were created at these spectacular venues. I love working with the elegant architecture and furnishings at these establishments to create truly dynamic wedding pictures. Give me a call if you are planning a Long Island Mansion wedding. I would love to be a part of your big day.